Breckenridge is renowned for its skiing and snowboarding, but with an average of 300 inches of snow every year, the area is also a great place for snowmobiles. 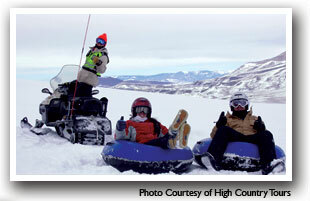 Breckenridge's snowmobile trails are located in the White River National Forest and can be accessed from two different directions. Take Highway 9 South and exit on Tiger Road; the parking area is about 5 miles East on the right side of the road. Or take County Road 35 about 3 miles North of Jefferson to Forest Service Road 400 and continue North for another 2 miles to reach the parking area. Ride up to the Continental Divide and you'll see stunning views of some of Colorado's 14ers. The trails are groomed by a private snowmobile company and frequently used by tour groups, so be prepared to share the trail!